As mentioned this is a sprint race in the labs to pass the fifty percent mark. Forty three percent is pretty well down the road. What no one bothers to mention is that commercial product is still running a marathon. The best is shipping with conversion levels closer to fifteen. See last story. In fact, we cannot be too optimistic that this will improve soon. After all, we have been trying for years to make it better. We have unending lab improvements but a very slow transmission into deliverable hardware. I would like to see more focus on structured quantum waveguides to see if that can change things. The good news is that once you set aside the effort to maximize yield and turn to lowering costs, we are getting progress. Nanosolar likely achieves yields of around 10 to 13% but using print methods is bringing costs down to under $1.00 per watt. So we need 400 square miles of desert instead of 100 square miles of desert. No one will care because the cost is right and any improvement is easily implemented on a plug and play protocol. The real sprint race is in the real world as the race is on to supply solar power at $1.00 per watt to everyone. We are entering a new energy world in which we have a huge national grid, solar roofing and siding perhaps, geothermal and ample wind power and were needed and small nuclear were necessary to supply a central heat supply. There are three separate stories appended. In a record reminiscent of a 100-meter dash, scientists at the University of South Wales in Sydney, Australia, have created the world's most efficient solar power cell ever...by a hair. Professor Martin Green and his colleague Anita Ho-Baillie led a team of U.S. researchers to victory with a multi-cell combination that is able to convert 43 percent of sunlight into electricity. The previous record was 42.7 percent. To capture light at the red and infrared end of the spectrum, the researchers threw everything into the cells--gallium, phosphorous, indium, and arsenic, plus silicon. While a bunch of the semiconductors used are expensive, the scientists did raise the efficiency bar. Ho-Baillie and Green broke a different solar record with a silicon solar cell last October. If they continue to combine their efficient cells with technology from the folks at the National Renewable Energy Lab and Emcore, maybe they'll make ones that can convert 50 percent. I can't wait for the sunny day when that happens. Researchers at the Fraunhofer Institute for Solar Energy Systems ISE have set a new record for solar cell efficiency. Using concentrated sunlight on a specially constructed multi-junction solar cell, the research group lead by Frank Dimroth has achieved 41.1% efficiency for the conversion of sunlight into electricity. The breakthrough, which surpasses the 40.7 percent efficiency previously demonstrated by Spectrolab , involved the use of sunlight concentrated by a factor of 454 and focused onto a small 5 mm? 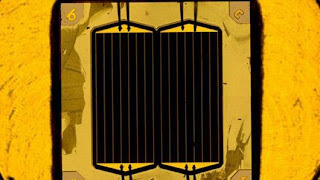 multi-junction solar cell made out of GaInP/GaInAs/ Ge (gallium indium phosphide, gallium indium arsenide on a germanium substrate). Even at a higher sunlight concentration of 880, an efficiency of 40.4% was measured. Multi-junction solar cells combine semiconductor compounds in layers to absorb almost all of the solar spectrum. The problem is that in combining these materials in a process known as metamorphic growth, defects occur in the lattice structure making it difficult to grow the III-V semiconductor layers with a high crystal quality. The Fraunhofer ISE researchers have overcome this issue by discovering a way to localize these defects in a region of the solar cell that is not electrically active, meaning that the active regions stay relatively defect free and higher efficiencies can be achieved. The Fraunhofer Institute verifies that a Suntech Power multicrystalline silicon panel has beaten Sandia’s record. Suntech intends to have a 300MW capacity to produce its new Pluto cells in 2010. Suntech Power said Wednesday it now holds the world record in producing the most efficiency multicrystalline silicon panels, beating a record previously held by Sandia National Laboratories. A panel sporting the company's newly developed Pluto cells was able to convert 15.6 percent of the sunlight that strike it into electricity, Suntech said. The Fraunhofer Institute of Solar Energy Systems in Germany, one of the few labs in the world whose test results are recognized by the industry, verified the efficiency of the panel. The panel rolled off a new factory line China-based Suntech set up to start shipping Pluto panels earlier this year. The new record will be included by the science journal Progress in Photovoltaics (PIP) that periodically publishes a list of record-holding efficiency for different types of solar cells and panels. "Improving the conversion efficiency of multicrystalline silicon modules has proven particularly challenging and this is a very impressive achievement for such a large module from a commercial supplier," said Martin Green, research director of the ARC Photovoltaics Centre of Excellence at the University of New South Wales in Australia, in a statement. "I can confirm that the 15.6% multicrystalline module result is the highest known conversion efficiency measured by a PIP-recognized test center," added Green, who is on the journal's committee. Suntech's efficiency number isn't much higher than the 15.5 percent record previously held by Sandia. But Suntech contends its panel could have surpassed 16 percent if it were tested without its frame, as was the case with Sandia's panel. The new record is a boost to Suntech's plan to market panels assembled with Pluto cells, which it developed with technology licensed from the University of New South Wales. Suntech's founder and CEO Zhengrong Shi taught at the university for years. The university holds the world record for silicon cells made in a lab, which were tested by Sandia and yielded 25 percent efficiency. Cells made in the labs tend to be able to achieve higher efficiencies than those from commercial production lines. The Pluto technology focuses on improving the cell's ability to trap light to boost electricity production. Pluto cells also use copper instead of silver for its collector and bus lines, which act as highways for transporting the electricity produced by the cells. Silver is the common material from these lines, but it can be pricey. Copper has similar conductivity but is cheaper. Suntech also uses less copper to further reduce cost, said Steve Chan, Suntech's chief strategy officer, in an interview. Chan who declined to disclose Pluto's manufacturing costs. Pluto can be used to make either monocrystalline or multicrystalline cells. The technology has produced monocrystalline cells with close to 19 percent efficiency and multicrystalline cells over 17 percent, Suntech said. In general, monocrystalline cells are more expensive to make partly because growing single-crystal silicon is more time consuming and energy intensive, but they yield higher efficiencies. Most of the silicon panels on the market today are of the multicrystalline variety. SunPower, in San Jose, Calif., is known for producing the most efficient monocrystalline silicon cells for the market today. It is making cells with 22.5 percent efficiency. Its panels could achieve a little over 19 percent efficiency. Suntech started shipping Pluto panels earlier this year, but the volume has been small. Suntech is producing them at about 1 megawatt to 2 megawatts per month, Chan said. The company expects to ship 10 megawatts to 15 megawatts of Pluto panels by the end of 2009. Pluto panels have been installed in China and Australia. Suntech is waiting for IEC and UL certification to sell them in Europe and the United States. Suntech is ramping up its production to mass produce them in 2010, when Suntech is set to have the manufacturing capacity to produce 300 megawatts of Pluto cells per year, Chan said. Suntech already has a 1-gigawatt capacity to produce silicon cells with an older technology, making it one of the few in the world with that much production capability. The company plans to convert its existing lines to make Pluto products, a process that would take about three years, Chan said. Suntech has historically produced mostly multicrystalline silicon cells. Chan declined to say whether the company would shift that strategy with its Pluto lines. Suntech is scheduled to announce its second-quarter earnings on Thursday.